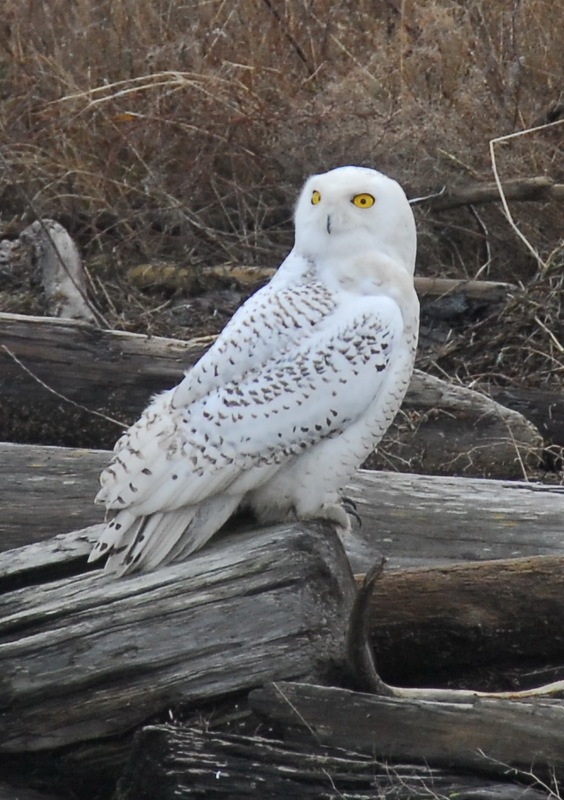 Snowy owls, who spend most of their lives in the arctic, have descended on southern Canada and parts of the northern United States in record numbers this winter. Well, not so much record numbers, but large numbers that we only see approximately every seven years (and I’ve lived near one of their stopping spots for over twenty years and never seen them before this!). 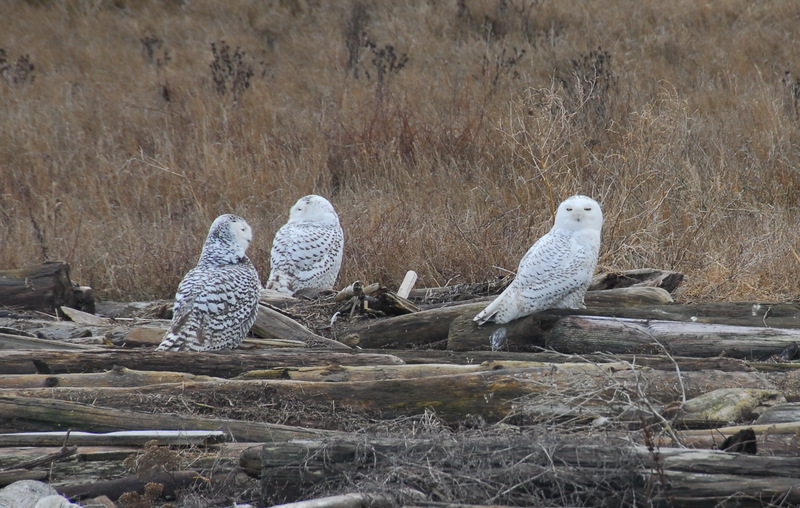 Snowy owls usually remain in the arctic all year, and I’ve read two somewhat contradictory-sounding theories about why large numbers of them head south when they do (both theories involving lemmings). In the arctic, the owls’ main food source is lemmings (those small rodents that are said to follow one another over a cliff –which is a myth to account for their sometimes sudden population drops). Lemming populations naturally rise and fall (no cliffs involved). I’ve read that when lemming populations are down, the Snowy owls venture south to look for food, but I’ve also read the opposite. When the lemming population drops, so do Snowy owl births, and when the lemming population rises, the number of owls rises as well. So, a second theory suggests that it’s after a big lemming year that there are so many owls, many need to head south to look for winter food. Maybe it’s a combination of both: more lemmings, more owls, then the lemming population drops and there are still a lot of owls but not so much food. Whatever the reason, I benefited this year by getting to see a lot of these wonderful birds up close! We counted 21 owls sitting on logs and stumps near the walking path on the dike along the edge of Boundary Bay in Richmond (near Vancouver). They appeared to be mostly just resting, undisturbed by the human onlookers, though occasionally one would take flight and glide a short way to another rest spot. It was especially impressive each time an owl slowly rotated its large stocky head and pierced me with those uncanny yellow eyes. 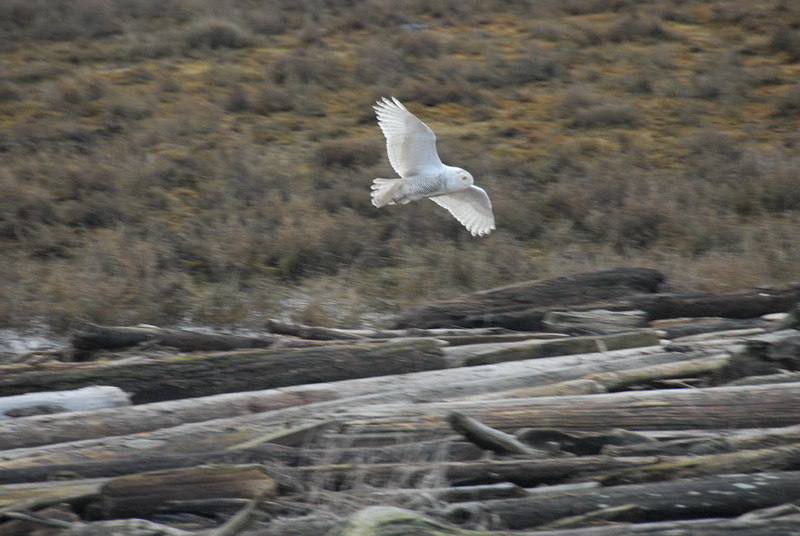 While most owls tend to hunt at night, Snowy owls are active in the day, feeding mostly at dawn and dusk. During their southern stopover they eat mice, voles, ducks, hares and even fish. They also need to conserve energy for their flight back to the arctic, so it’s important not to disturb them.